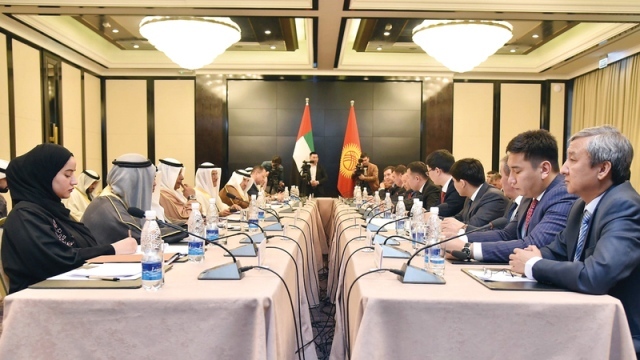 The Kyrgyz capital, Bishkek, yesterday hosted the first joint economic committee with the United Arab Emirates and Kyrgyzstan to develop a roadmap for the next phase, establishing a sustainable trade and investment partnership. The committee included programs and mechanisms to strengthen cooperation frameworks in 13 vital sectors, including trade and investment, the Halal industry, financial services, industrial cooperation, small and medium enterprises, innovation and information technology, cooperation in agriculture and livestock, transport and civil aviation, tourism and education and renewable energy. The committee's report included setting up frameworks for cooperation between the cities of Bishkek and Dubai and means of cooperation in the development of the free economic zone in the province of Narin on the Kyrgyz border and opening the way to European and Asian markets. Minister of Economy Sultan bin Saeed Al Mansouri said that Kyrgyzstan is an important country in the Central Asia region. The visits of officials and business forums will stimulate joint efforts to set a roadmap for the next phase, establishing a sustainable trade and investment partnership in which the private sector will play a leading and effective role. He pointed out that the increase in the volume of trade exchange is one of the top priorities of cooperation during the next phase, pointing out that despite the jump in the growth rates of trade exchange between the two countries, which rose between 2012 and 2017 by 207%, the number of non-oil foreign trade is still modest and Reflecting the aspirations and potential of the two sides, recording during the year 2017 about 310 million dollars. "Expo 2020 Dubai offers an ideal opportunity for partners in the Kyrgyz Republic to start a new phase of trade and economic cooperation between the two countries, both at the governmental and business levels. For his part, the Deputy Prime Minister of Kyrgyzstan, Gnich Razakov, that the government of his country has a genuine desire to enhance the presence of UAE investments in their markets, and the establishment of partnerships in a number of development sectors that serve the common interests and achieve mutual benefit.